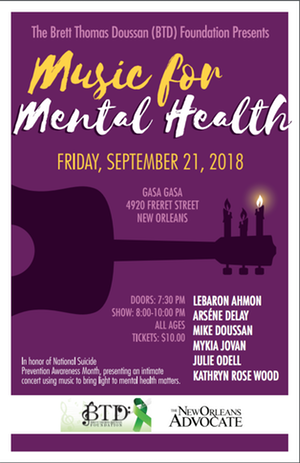 The 2nd Annual Music for Mental Health Concert will feature LeBaron Ahmon, Arsene DeLay, Mykia Jovan, Julie Odell, Mike Doussan and the event’s coordinator, Kathryn Rose Wood. Together, they represent hip-hop, soul, blues, roots rock, R&B, indie and Americana. 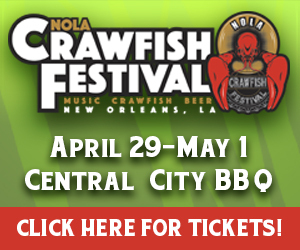 This year’s Music for Mental Health Concert will benefit the New Orleans Musicians’ Clinic, NAMI New Orleans, and the American Foundation for Suicide Prevention Louisiana Chapter, as directed by event sponsor, the Brett Thomas Doussan (BTD) Foundation. $10 tickets for the 18+ benefit can be purchased at http://www.gasagasa.com.